International human rights lawyer and Jerusalem Center Scholar-in-Residence Justus R. Weiner researches the status of human rights in the wake of the Israeli‑Palestinian peace process. Global Law Forum, Jerusalem Center, January 19, 2010.
with Avi Sutton, Global Law Forum, Jerusalem Center, January 1, 2010. Middle Eastern Christians: Battered, Violated, and Abused, Do They Have Any Chance of Survival? Jerusalem Viewpoints, No. 72, September 2008. Jerusalem Issue Brief, Vol. 6, No. 14, December 7, 2006. Oregon Review of International Law, Vol. 7, p.26, 2005. Mediterranean Journal of Human Rights, Vol. 8, No. 2, p.383, (Faculty of Law, University of Malta, 2004). Jerusalem Center for Public Affairs, 2010. Global Law Forum, Jerusalem Center, January 1, 2010. Jerusalem Viewpoints No. 537, December 2005. Faultlines, Vol. 16, p. 63, (Institute for Conflict Management in New Delhi, India, 2005). Harvard Israel Review, Vol. 3, Summer 2003. Temple Journal of International and Comparative Law, Vol. 16, No. 1, p.43, 2002. Jerusalem Issue Brief, Vol. 2, No. 8, October 1, 2002. Jerusalem Viewpoints No. 441, November 1, 2000. Jerusalem Viewpoints, No .565, July 2008. Wye River Memorandum: A Transition to Peace? Cornell Journal of International Law, Vol. 29, p.101, 1996.
with Noam Weissman, Jerusalem Viewpoints, No. 545, 1 August 2006.
Who Will Keep the Peace? The Role of Peacekeeping in a Future Israeli-Palestinian Peace Accord,"
Jerusalem Issue Brief, Vol. 2, No. 21, March 23, 2003. Jerusalem Viewpoints, No. 498, 15 May 2003. In 1999, Commentary Magazine published my expose “‘My Beautiful Old House’ and Other Fabrications by Edward Said,” which exposed how Said had reinvented his life story. The house in Jerusalem was in fact the home of relatives whom Said occasionally visited. Edward Said actually grew up in Cairo, the scion of a wealthy Cairene family. His father had moved to Cairo from Jerusalem a decade before Edward was born. Until his departure to attend prep school in America in 1951, Edward Said resided with his family in exclusive Zamalek neighborhood and attended private English and American schools. The “best-known Palestinian intellectual in the world” (as described on BBC) weaved an elaborate myth of expulsion from paradise. 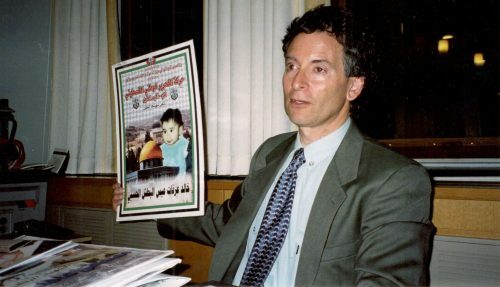 Edward Said was never a refugee from Palestine, but he is certainly a refugee from the truth. Letter to the Editor, New York Review of Books, February 24, 2000.